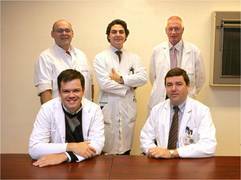 The OLV Hospital's Department of General Surgery has enjoyed an excellent reputation for more than a century and countless general surgeons from all over Belgium have trained here over the years. 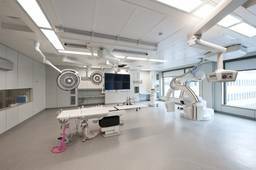 The Department is one of the leading centres of its kind in Europe, having performed approximately 2,000 laparoscopic colorectal resections (including 430 cases of colorectal cancer) to date. Over 100 colorectal surgeons from Belgium and across Europe have attended live demonstrations within our Department; we also have considerable experience in performing laparoscopic upper gastrointestinal (GI) surgery (gastrectomy, antireflux surgery, splenectomy and adrenalectomy). With a 4 or 5 trocard approach the 'bad' part of the colon is mobilised laparoscopically after having controlled the vascular supply and then removed trough a mini-incision. Then, depending on the site of the lesion, a transanal or extracorporal anastomosis is performed. The obvious advantages are less pain, less woundproblems, less complications, faster recovery, shorter hospital stay and very probably there are also oncological benefits. The average hospital stay is 5 to 7 days. With a 3 or 4 trocard approach the gallbladder, containing gallstones, is freed and removed. Hardly any pain or discomfort are present postoperatively. More than a hundred Belgian and other European colorectal surgeons have been visiting his life demonstrations. He is also an expert in laparoscopic upper GI surgery (gastrectomy, anti-reflux surgery, splenectomy, adrenalectomy, and bariatric surgery).